In other writing news, I received an email last week from a literary agent. Expecting the old ‘I liked it, but…’ rejection that every writer who has ever submitted anything gets, I found myself stopping and reading again. Why? This was no rejection email - this was an agent saying she loved my novel and was offering a Skype call to discuss representation!!! We arranged a day and time and a few days passed in a daze. I logged into Skype 45 minutes early…or I tried to, on two machines… panicked searching revealed logins to Skype were down worldwide. 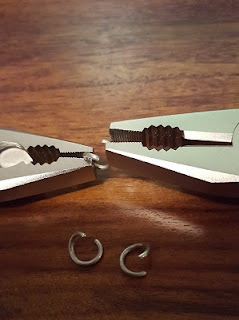 Argh!! Nightmare! Except, it was only for apps, and Skype for Web worked fine, phew, last minute save. The discussion went incredibly well and I’m ecstatic to say that I’m signing with Amanda Rutter of Red Sofa Literary. This novel of mine will be heading out into the world after a few nips and tucks. It’s been an eventful and exciting month for me on the writing front, a whirlwind of new experiences, nerve-wracking waits and last minute panics (more on this in the very next post). 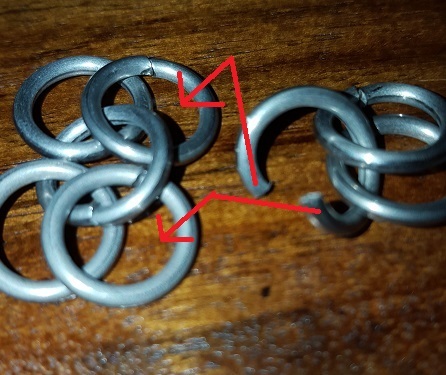 -Author Miles Cameron (of The Red Knight fame) talking about war logistics, scouting, water supplies, and why Sauron should have waged economic warfare on Gondor to bring it to ruin instead of going for ‘The Big Win’. -An interesting panel on anti-heroes that featured, amongst others, Neil Williamson and Adrian Faulkner. -The Gemmell Awards, where a lot of truly excellent books were up for the Morningstar award, including Battlemage by Stephen Aryan, The Vagrant by Peter Newman, and Starborn by Lucy Hounsom… with the frankly huge award bust eventually won by Peter Newman for The Vagrant. 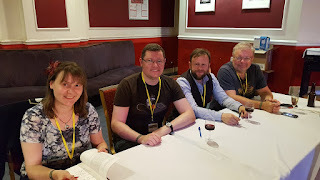 On the Saturday of the con’ Thirty Years of Rain launched alongside offerings from the excellent Newcon Press and a small selection of our authors were signing books – my first ever signing! At which point I realised I need to come up with a list of witty comments to write in books. Also, remember to bring a pen, you fool! Oops. This was then followed by my first ever story reading, to a small room of people. Eep! *Has flashbacks to horrible high school English talks (it was on sharks if you are interested)* It went well, and I had excellent reading-mates in Neil Williamson, Ruth EJ Booth and Ian Hunter. 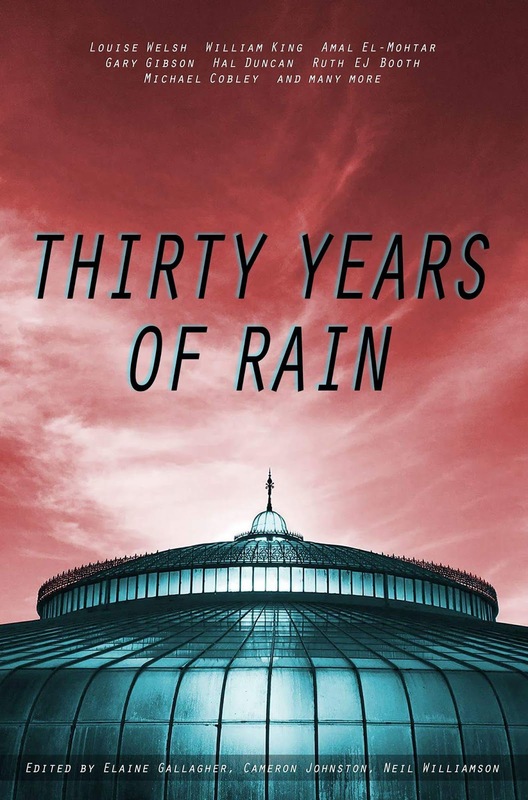 The week after heralded the second launch of Thirty Years of Rain, and this time a horde of people packed into Watersones on Sauchiehall Street, Glasgow. There were excellent readings from Elaine Gallagher, Ruth EJ Booth, Elsie WK Donald, Ian Hunter, Michael Cobley and Hal Duncan. 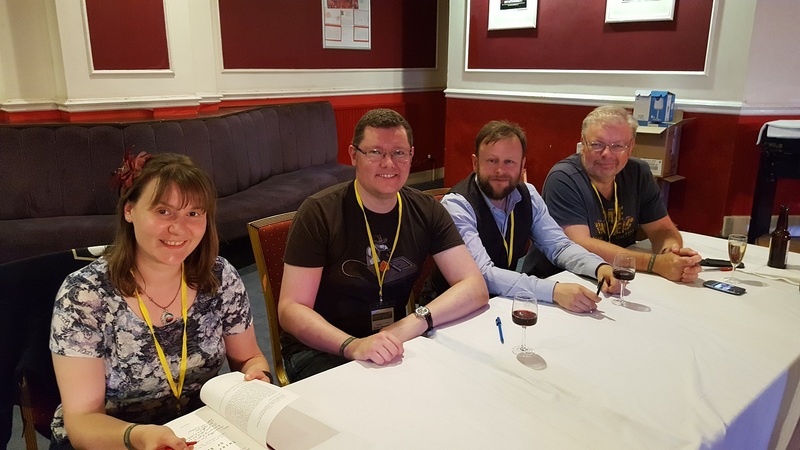 Then followed a Pokemon hunt (gotta catch em all) to track down the contributing members of the Glasgow SF Writer’s Circle in attendance to get their scrawl down on paper. 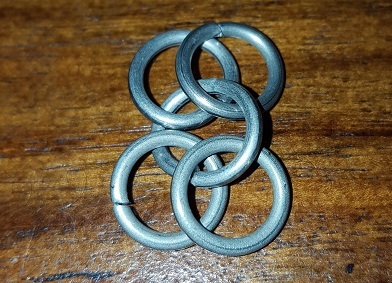 All in all, an excellent night! 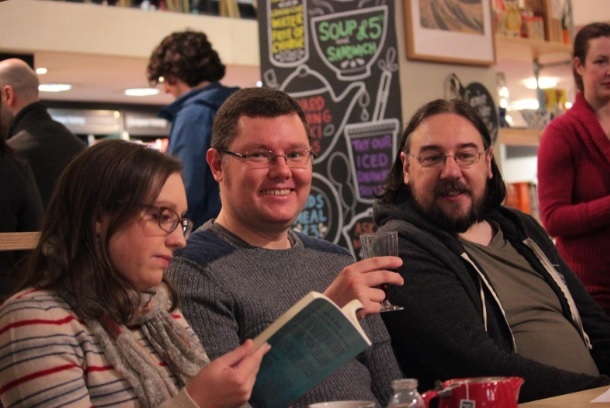 Celebrating 30 years of the Glasgow Science Fiction Writer's Circle (yes, really, 30! Years! 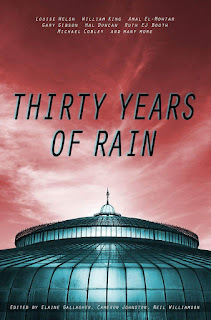 ), Thirty Years of Rain is being launched next month. It being the rainy city of Glasgow, we feel it is an entirely appropriate title. Many fine wordsmiths have sat in a circle on a rainy night critiquing stories at the GSFWC before decanting to a nearby pub to buy the poor author a pint to numb the pain. A large number of weird and wonderful stories have been born from that very post-crit pub chat. Many of our members have gone on to have stories and/or novels published professionally, people like Gary Gibson, Hal Duncan, Neil Williamson, William King, Michael Cobley, amongst many others. There will be a book launch at FantasyCon this year at 3pm on Saturday 24th alongside NewCon Press in the Main Ballroom of The Grand hotel. Come along for the launch, buy a book, join the chat. Or maybe even join the group and come along to the GSFWC sometime. It's a special kind of honour when a friend gives you a cameo in their novel, especially when they kill you off in horrible ways. Hat's off to Edward Cox for including me in The Watcher of Dead Time - an excellent end to a fascinating series. I an unashamedly a fan of LEGO, having rekindled my love for it over the last five years. At some point I will even post my ye olde fantasy tavern for villains that I've been building, a haven away from those pesky do-gooder adventurers. 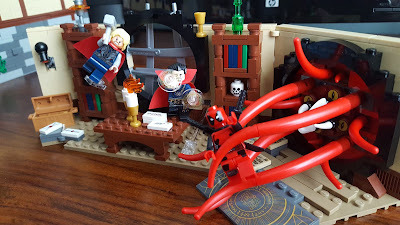 The Dr Strange set was a lot of fun to build, much more interesting than many smaller sets, and the tentacle monster o'doom is fantastic. Of course I livened the scene up with a few of Dr Strange's colleagues. The story here is: Never let Deadpool play with your stuff! The Glasgow SF Writers' Circle 30th anniversary anthology is almost finished! *much excitement and celebration* We have called it Thirty years of Rain, and as anybody living in Scotland can tell you, it's an incredibly apt name. A whole heap of work has gone into this, and some hard decisions too, and I'm so happy with how it has turned out. We have some truly amazing and wonderful, and creepily disturbing stories between the pages from well-known authors, and some old hands and up-and-comers alike. I'm very happy to be returning to writing my own fiction, but I think I've learned some important things from this, not least polishing of my editorial skills, an improvement that I can hopefully apply to my own writing. -I've written something - now what? -How do I make it better? How do you edit? -How do I find publishers/markets? With that in mind I've decided to create a writing resources page on this site that I will update with other sites and resources of interest to people developing their writing skills. I'm hoping that some of you will find it useful. 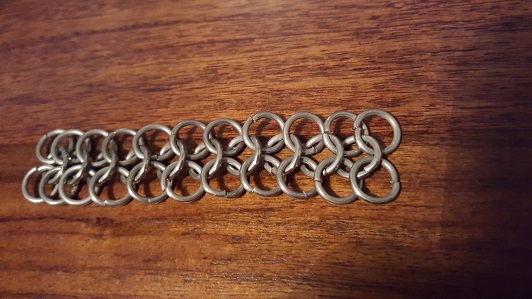 Over the last year I've been learning how to make chainmail, and steadily working away on a chain haubergeon. It's surprisingly easy....mostly. The basics are very simple indeed. 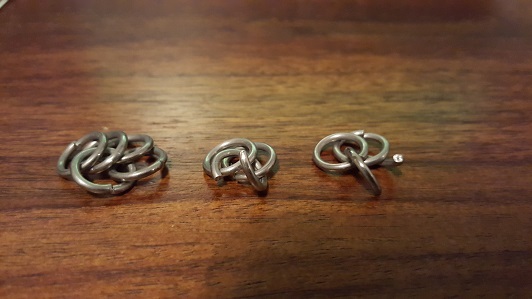 Here's how to construct European 4-in-1 maille. 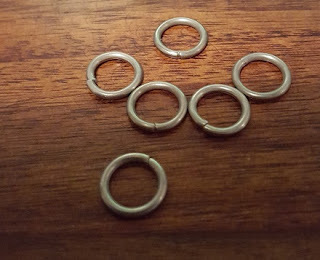 You can either start with a spool of wire and construct a mandrel and cut your own rings or you can buy jump rings like I did (not having the space for such equipment, and I'm working in stainless steel to complicate things.) 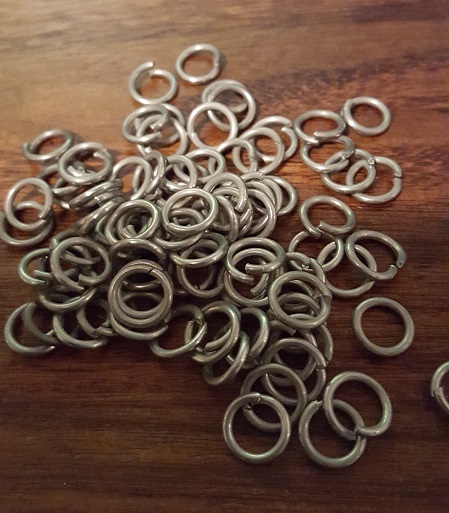 Sites I can recommend for supplies would be Armchair Armoury in the UK and The Ring Lord in the US/Canada. Notice that the middle ring has 4 rings though it. 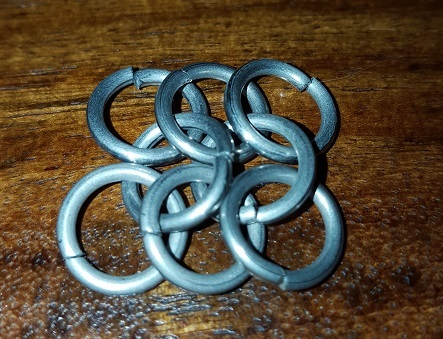 This is what we mean by European 4-in-1 maille, every ring should be joined to 4 others. 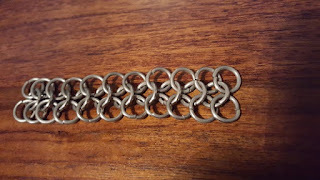 There are many other kinds easily findable via web search, such as dragonscale maille. If you lay two strips side by side you will see four closed rings just ready to have an open ring threaded through (from right to left in this case, through the rightmost column's middle two rings, and then the second column's) and then the ends closed using pliers. 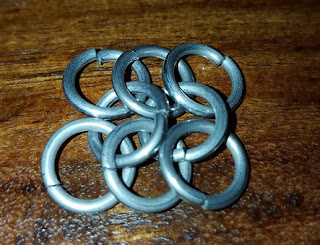 In this way you can easily create patches of maille ready to be joined together to make a larger item. 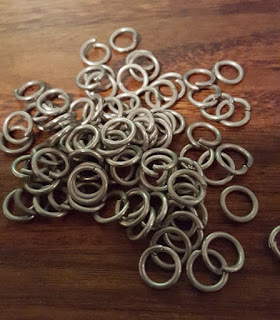 Trust me, it's FAR easier working with small patches than adding row after row to a large, awkward and heavy shirt. Up and Coming: Stories from the 2016 Campbell-Eligible Writers (Which includes me!) anthology has been released, available for free download until the end of March from the folks at Bad Menagerie. Thanks go to SL Huang & Kurt Hunt for organising and compiling this years' anthology. It includes stories from writers currently eligible for the John W.Campbell Award for best new science fiction or fantasy writer, which means writers who had their first sale to a professional paying market within the last two years. I expect to be reading awesome fiction from many writers I haven't encountered yet. This anthology also includes me after the publication of The Economist & The Dragon by Buzzy Mag in 2014. So hurrah for that! :D At the time Buzzy Mag also posted me THE most ridiculously lovely hand-written thank you card when they accepted the story, saying that they enjoyed it very much. That blew me away - so nice of them! This year I will be attending Eastercon in Manchester in March and Satellite 5 in Glasgow in May, and possibly Fantasycon by the Sea in Scarborough in September. Feels a little strange to think that my first ever con was only in 2013, that being World Fantasy Con in Brighton. It was a big and bustling venue and as a newbie to cons I found it quite intimidating at first, but fortunately a goodly number of the GSFWC crew were down for it and I quickly met some other rather interesting writers. That first con is also notorious for the 'Ambush Opera' organised by Neil Williamson. 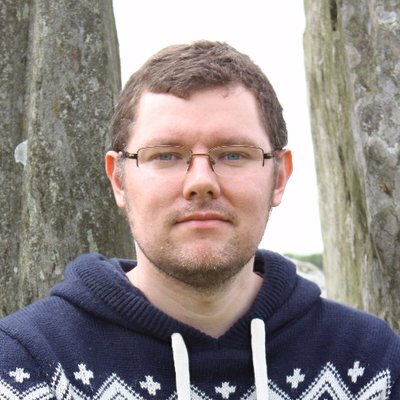 As some of you might know, I am one of the editors for the Glasgow Science Fiction Writers' Circle 30th anniversary anthology. It's been an eye-opener. For the first time I am on the other side of the editorial fence. I'm much more used to submitting fiction and waiting for the inevitable rejections to arrive (Boo! Hiss! ), interspersed with the occasional and joyful acceptance email when my stories find the right home. Instead I'm reading my way through other people's submissions and making comments for our other two fine editors. Fortunately we have a group of excellent writers sending us stories so I will miss out on the pleasure of reading outright gibbering bonkers and bad writing that open submission markets must get. It's early days yet but I can reveal that we have already had some really fascinating fiction hitting our inboxes. This anthology project has got me thinking about the role of editor. It's proving very time consuming, even with the relatively small numbers of submissions that we are dealing with. I am reading a story for initial enjoyment, having a think, then reading it again for quality of prose, style, plot and character - breaking down what does and does not work for me. Fortunately as a seasoned GSFWC'er with some stinker trunked stories behind me (as we all have), I'm used to this critiquing process. Fortunately I have the time to go through each submission this way for our anthology - I really doubt an editor for a commercial fiction market has anywhere near that kind of time. I know many writers moan about receiving form rejections, but with their volume of submissions, if something didn’t grab me in the first few pages I'd not be keen to read on. I've always appreciated when editors take a little time (in very short supply) to say why a story of mine didn't work for them, and often that's allowed me to improve it for the next market, but it's no wonder many have slush readers to weed out the poor or unsuitable stories. Fortunately, as with my fellow GSFWC 30 editors on occasion, opinions do differ, and one editor’s lacklustre story can be another’s piece of gold. Cover artwork, edits, more submissions...editing this anthology is proving most interesting. I'm also very aware I'm currently wielding the mighty spiked Hammer of Rejection! It's kinda scary.